Author Trent Hone joins us today to talk about his new book Learning War: The Evolution of Fighting Doctrine in the U.S. Navy, 1898-1945. This is a great book. And as others have noted, it’s a fine compliment to John Kuehn’s work on the Navy General Staff, Scott Mobley’s book Progressives in Navy Blue, and I would add, Albert Nofi’s To Train The Fleet For War: The U.S. Navy Fleet Problems, 1923-1940. We talk about everything from Admiral Frank “Friday” Fletcher to “safe-to-fail” systems vs. “fail-safe” systems. And stick around to the end. Trent Hone offers some advice to the CNO on how we can build a better learning organization. Nelson: For the readers, could you tell us briefly what your book is about? Hone: My book investigates how the U.S. Navy of the early twentieth century learned to innovate. 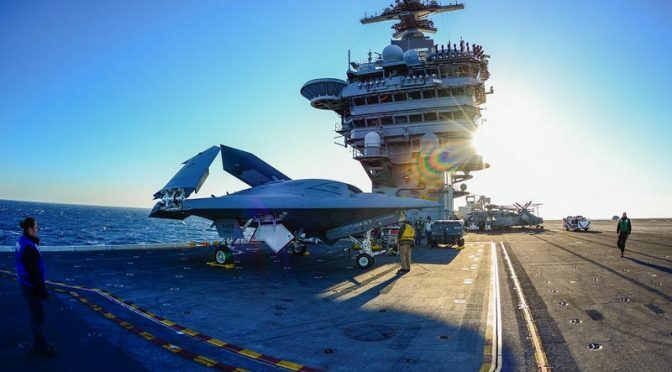 I explore how the Navy invented new technologies, created new tactics, and found ways to rapidly evolve its combat doctrine based on peacetime exercises and wartime experience. Today, we would describe the Navy of that era as a “learning organization.” I explain what that means and describe the mechanisms the Navy used to effectively learn and innovate. I believe there are lessons from that time that are very relevant for today’s organizations, both military and civilian. Nelson: Why did you want to write this book? Hone: I’ve been interested in naval tactics for a long time. I remember reading Wayne Hughes’s Fleet Tactics when it first came out in the 1980s and being fascinated (It’s a great book now on its third edition). In the 1990s, I decided to explore the Navy’s surface warfare tactics before and during World War II. I wanted to know what Admiral Husband E. Kimmel might have done if Pearl Harbor hadn’t been attacked. That research led to a series of articles on the development of Navy tactics—including a prize-winning one in the Naval War College Review—and, ultimately, began to overlap with other work I was doing. I started my career as a software engineer. As I assumed positions of greater responsibility, what became most interesting to me was not the development of the software, but how teams organized to create software and do innovative work. I studied various techniques and methods to improve the teams I supervised and eventually transitioned into advising and coaching organizations to help them get better at learning and innovating. As I continued looking at the evolution of the Navy’s tactical doctrine in the early twentieth century, I saw patterns that resonated with today’s most-effective learning techniques. The language was quite different, and the specific processes were different, but some of the underlying principles were remarkably similar. I realized it was a story that had to be told. I describe an arc of innovative creativity that stretches back decades by charting the evolution of surface warfare tactics. Nelson: Early in the book you talk about “fail-safe” systems and “safe to fail” systems. The latter, you say, are best for a culture that encourages innovation. With this in mind, what would you say Rickover’s submarine culture consisted of? Is he a rare exception in the case of a system that is “fail-safe” yet innovative? Hone: I’m glad you brought this up. Alicia Juarrero’s term “safe to fail” gives us a new way to think about failure modes and how to account for them. The key difference between the two is that with “fail-safe” we attempt to anticipate possible failure modes and design ways to mitigate them. With “safe to fail,” we recognize unanticipated failure modes will occur and organize to ensure survival when they do. This has relevance to organizations because when we want to learn and innovate, we are going to fail. A “safe to fail” organization finds ways to explore new ideas and experiment with them without endangering its long-term survival. The Navy was good at that in the early twentieth century. I’m less familiar with Rickover’s time, but from what I understand, it would be inaccurate to describe the culture he developed as primarily “fail-safe.” Certainly, it used procedures with rigidly prescribed steps in order to prevent known failures, so in that sense it was “fail-safe.” However, he recognized that unanticipated failure modes can and will occur. Defined procedures are inadequate to account for these circumstances. Instead, it’s essential to rely on the collective skill and experience of people, so the culture integrated crewmembers together. Layers of human observation and experience became the means to identify, anticipate, and address unforeseen circumstances. In that sense, the culture has a “safe to fail” component. Things will go wrong; people will make mistakes. But trust and experience become the means to identify and resolve them. As it turns out, that’s the most effective way to deal with problems in complex environments. Standard procedures and automated routines free our mental capacity so that when unforeseen circumstances arise, we can quickly identify and address them. That’s what made the Combat Information Center (CIC) and its successors effective: the artful integration of standard processes, technology, and human judgment. I worry that with the increasing emphasis on automated systems, we might be taking the talents of our people too far out of the loop. There’s no substitute for human experience and skill when the unanticipated occurs. Nelson: What is the “edge of chaos” and why does it matter to any organization that is trying to be innovative? Hone: The concept of the “edge of chaos” is easily misunderstood, so I’ll try to explain it succinctly. In any complex system—like a corporation or a military service—there are processes, procedures, and rules. In the language of complexity, these are called “constraints.” They channel and limit behavior. When constraints are restrictive, they inhibit the ability of people to experiment and try something new. Obviously, that’s a problem if you want to innovate. But the other end of the spectrum is problematic also. If constraints are too loose, there’s no coherence; it becomes difficult to assign cause and effect or make sense of an experiment. The “edge of chaos” is located between these two extremes. It is a space where constraints are sufficiently loose to allow room to explore new ideas and concepts but also rigid enough to focus that exploration and provide feedback on its effectiveness. Many of us intuitively understand this from our own experience. Software teams, for example, are most innovative (and generally most effective) when they’re given a clear objective and the creative freedom to determine how best to accomplish it. The objective serves as a constraint and focuses their energy. They use their initiative to explore several potential solutions, often arriving at the best combination of technologies that addresses the need. That’s why there’s been such an emphasis on moving away from rigidly detailed requirements documents; they overly constrain teams and limit their creativity. The parallels to military command, and the importance of well-written orders that foster the initiative of subordinates, are obvious. Nelson: What was the importance of the 1921 Destroyer Instructions? Hone: The Atlantic Fleet’s 1921 Destroyer Instructions were important for two reasons. It was the first Navy doctrinal manual produced by a deliberately created system of learning. Immediately after World War I, the Navy was transitioning back to peacetime. Many valuable lessons had been learned during the war and officers set out to capture them. Two “colleges” were established, one in the Atlantic Fleet and another in the Pacific Fleet. They combined exercises at sea, wargames ashore, and experience from the recent war to devise new approaches. A regular correspondence was maintained between these two fleet colleges and the Naval War College. The result of their collective learning was incorporated into the Destroyer Instructions. The Destroyer Instructions were also important because they assumed individual commands—each destroyer squadron—would develop their own specific doctrines that reflected the strength of their ships and men. The Instructions were deliberately written to foster creativity within subordinate commands and avoid being overly prescriptive. The War Instructions of 1923 took the same approach, so Navy officers spent the interwar period exploring a variety of options for how to coordinate and employ their forces, leading to new and innovative techniques. Nelson: Who was Admiral Frank Friday Fletcher? What were his battle instructions? And why are they an important milestone in naval history? Hone: Frank Friday Fletcher led the intervention at Veracruz, Mexico, in April 1914 and was awarded the Medal of Honor for his conduct. In September 1914, he became commander of the Atlantic Fleet, which contained the Navy’s most modern ships. The Atlantic Fleet had been regularly conducting exercises to work out how best to operate in battle, and Fletcher continued that practice. By May 1916, he and his staff had gained enough experience to issue a set of Battle Instructions. Fletcher’s Instructions marked a departure from previous approaches. He assumed battle was fundamentally uncertain and that centralized control would likely be impossible; this led him to emphasize two things. The first was the use of a plan that would outline objectives for subordinates. Fletcher wanted to encourage their individual initiative and creativity without overly constraining them. Second, Fletcher stressed the coordinated use of all weapons. Previous battle plans had emphasized battleship gunnery. Fletcher recognized that other weapons were coming into their own, particularly destroyer torpedoes. He planned to use his destroyer squadrons very aggressively. These two concepts—the use of a plan and coordinated employment of all arms—remained central to Navy tactical doctrine through World War II. Nelson: I enjoyed your comment about “type commanders.” You note in your book that during World War II that minor actions were neglected. This mattered. And type commanders were born in light of these shortcomings. What were these “minor actions” and how did the type commanders address them? Hone: The Navy’s primary focus in the interwar period (1919-1939) was a trans-Pacific campaign. It was expected to culminate in a “major action”—a large fleet battle—somewhere in the central Pacific. Accordingly, most of the fleet-level tactical doctrine focused on “major action.” Tactics for “minor actions”—engagements between smaller task forces—were left to subordinate commanders. It was assumed that these lower-level commanders would have time to develop doctrines for their forces, and, during peacetime, this assumption was largely correct. However, there were shortcomings. This led to the introduction of the type commands in 1930. Type commands became responsible for identifying and capturing new tactical approaches for each various type—destroyers, cruisers, battleships, etc.—and there is evidence that new approaches were more rapidly developed after that date. The real problem, though, was the assumption that subordinate commands would be able to develop specific doctrines for their forces. In 1942, that process fell apart during the battles off Guadalcanal. Ships and commanders moved about too rapidly to develop cohesion. “Scratch teams” were formed and they often performed poorly, as you might expect. The Pacific Fleet addressed the problem by applying some of the same techniques used for “major tactics” to “minor tactics” and leveraging the type commands to rapidly share and disseminate lessons. Nelson: During World War II, how did the Fleet quickly inform commanders with updated doctrine? This is a problem throughout history, is it not? We make some assessments on what will or will not work in war, and inevitably we will be surprised. What would you recommend to a staff today on how to prepare for such things? Hone: I love this question because when I first started my research decades ago, I thought that manuals—published doctrinal materials—would be the key to understanding tactical doctrine. I learned very quickly that’s not the case. Doctrine is a set of assumptions and mental models. The documentation provides a backdrop, but what really matters is how individuals think about problems and work together. During World War II, the Navy effectively used personal connections, like in-person conversations and conferences, to rapidly share and disseminate new ideas. There were formal means to do this (like Joseph C. Wylie being brought back from the South Pacific to help develop the CIC) but informal mechanisms were at least as important. Published doctrine tended to lag behind the information shared through these informal networks. If I were making recommendations, I’d stress the importance of informal mechanisms. Staffs can easily create mountains of briefings and other documentation. What’s more difficult is creating an environment where subordinates can readily exchange information, learn together, and build on the knowledge of their colleagues. I think a staff should actively work on enabling that. It’s not just about creating space and time; it’s about introducing the appropriate constraints to enable creativity to flourish. Then, once that is in place, the staff needs to keep tabs on what’s happening. New, more effective ideas will arise. When they do, the staff needs to act quickly to exploit them and make them available to the entire command. Nelson: How does the size of a navy – the number of ships and sailors – affect innovation? Quick growth, during World War II, for example, and steep reductions – ship numbers from the 80s to today for instance, do these affect innovation in different ways? How? Hone: I think both offer serious challenges. 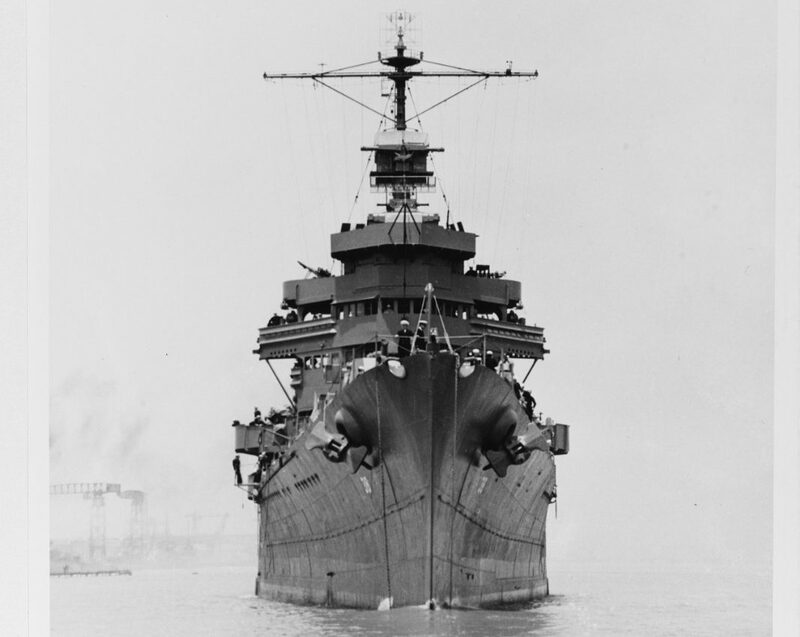 The rapid growth in World War II made it very difficult to maintain the effective culture the Navy had nurtured during the early twentieth century. Rapid “scaling” (as we call it in the software world) tends to increase centralization, reduce flexibility, and inhibit innovation. That happened to the Navy as it grew during the war. The challenge I see with steep reductions is overburdening. Organizations often reduce their size without an equivalent reduction in their commitments. This leads to overwork: people become spread too thin; maintenance gets delayed; and equipment is overutilized. Individuals may still be able to sustain the pace of operations, but they frequently lose the ability to experiment with new ideas. Innovation slows as a result. When commitments are reduced along with reductions in size—as with the Navy after World War I—this can be avoided. Nelson: Trent, to close, if you had ten minutes with the Chief of Naval Operations and he asked you what he needed to do to create a learning organization – what would you say? Hone: I had about thirty seconds with Admiral Richardson last year when he presented me with the second-place award for his Naval History Essay Contest, and in those thirty seconds, I encouraged him to read my book. If I had ten minutes, I’d urge him to introduce a set of integrated feedback loops that couple regular experimentation regarding the nature of future war (tactics, technology, etc.) and OPNAV’s programming process. The goals would be twofold. First, officers need to be encouraged to regularly experiment to vary their tactical approaches to discover new, more effective techniques. They need to become accustomed to adjusting to unanticipated circumstances and leveraging the creativity of their commands. Second, the lessons from their experimentation need to revise and guide the Navy’s program so that force structure and procurement reflect—and ultimately anticipate—the new learning. We’re all familiar with the interwar Fleet Problems. What made them really powerful—what allowed them to transform the Navy—was the way they were integrated into the Navy’s planning and procurement processes. 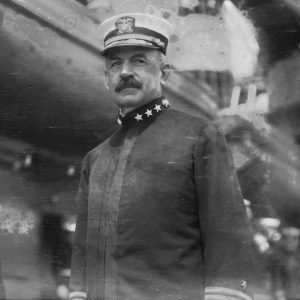 The second CNO, Admiral Robert E. Coontz, was primarily responsible for that. He created the feedback loops that allowed the Navy to not just experiment with new tactical doctrines, but to evolve force structure and war plans in light of emerging lessons. 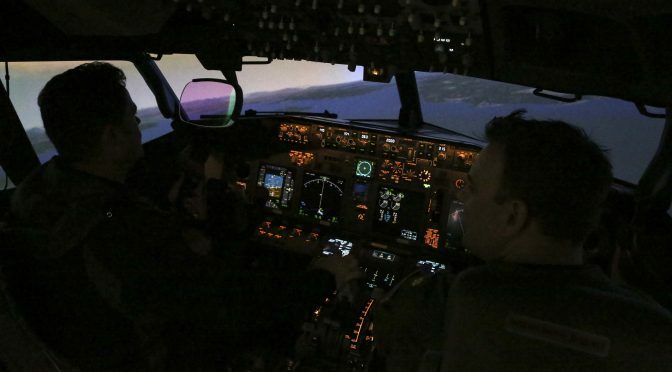 If Admiral Richardson wants “high-velocity learning,” if he wants to fully leverage the skills of the Navy’s officers, he needs to devise a set of similar mechanisms. Given the organizational changes since Coontz left office in 1923, a new set of structures and interfaces would have to be introduced. I have faith Admiral Richardson could do that, if he sets his mind to it. Trent Hone is an award-winning naval historian and a Managing Consultant with Excella in Arlington, VA. He is an expert on U.S. Navy tactics and doctrine. His article, “U.S. Navy Surface Battle Doctrine and Victory in the Pacific” was awarded the U.S. Naval War College’s Edward S. Miller Prize and the Naval History and Heritage Command’s Ernest M. Eller Prize. His essay, “Guadalcanal Proved Experimentation Works” earned second place in the 2017 Chief of Naval Operations Naval History Essay Contest. He regularly writes and speaks about organizational learning, doctrine, strategy, and how the three interrelate. 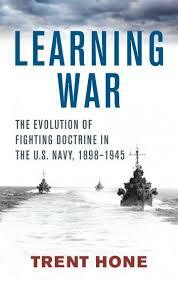 His latest book, Learning War: The Evolution of Fighting Doctrine in the U.S. Navy, 1898–1945, was published by the U.S. Naval Institute in June 2018. 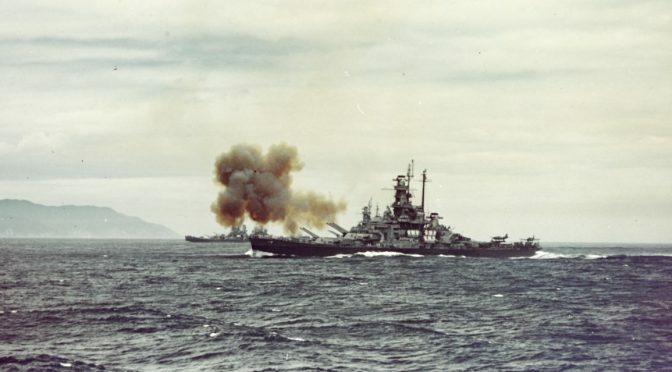 Featured Image: USS Indiana (BB-58) fires a salvo from her forward 16″/45 guns at the Kamaishi Plant of the Japan Iron Company, 250 miles north of Tokyo. 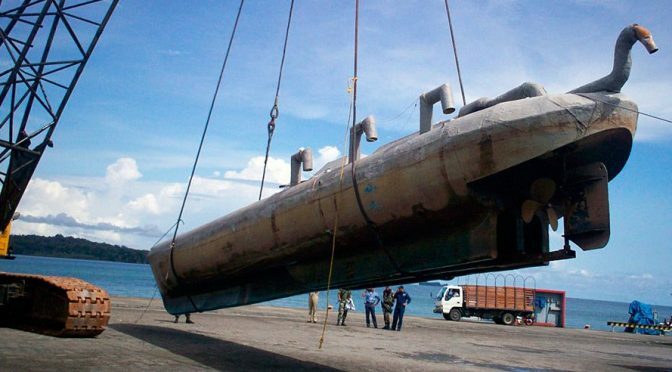 Last year, the Colombian Navy detected and captured the first electric narco-submarine.1 Demonstrating the innovative capacities of Colombian drug traffickers, narco-submarines, drug subs, narco-semisubmersibles, self-propelled semisubmersibles, or simply narcosubs, are maritime custom-made vessels used principally by Colombian drug traffickers with the purpose of smuggling illicit drugs to consumers or transshipment countries. This year only one of such vessels have been captured, and given their technical characteristics seems a step back in the ‘evolution’ of narcosub technology. Such is the paradox of security and maritime interdiction in the War on Drugs. The very process of thwarting a particular method or route creates the conditions to propel technological innovation on the drug traffickers’ side. The narcosubs are one of many of these innovations. The term “narcosub” encompasses a diversity of watercraft that includes semisubmersible and fully submersible vessels. Several entries on CIMSEC (here, here, and here) have already delved into the characteristics of the narcosubs and their potential capacities to threaten regional security. In addition, several studies in the security field, such as by Ramirez and Bunker,2 as well as academic articles, have also attempted to provide technical evidence and policy advice. To summarize, narcosubs are characterized by the use of maritime diesel engines, a rudimentary system of refrigeration, no facilities, fiberglass hulls, and a valve which can be activated in case of being captured that allows water to fill the hull and sink the vessel. Narcosubs are not made to last, as smugglers mostly discard such vessels after ending their one-way journey. Smugglers have been using narcosubs from at least as early as 1993, but the majority of captures have been made since 2005. Narcosubs are described by the Navy as vessels that are highly difficult to detect and/or track, due to their lack of emissions, small wake, and low heat signature, preventing visibility all around. Despite the centrality of innovation in the War on Drugs, there have been few attempts to understand the process. Given that 90 percent of the cocaine from Andean countries is transported using maritime routes,3 it is necessary to analyze the development of drug trafficker and state agency technologies in the maritime environment. That is to say, the study of the game of cat and mouse between interdiction and evasion. Innovation in the design and building of these vessels is so commonplace that the adjective ‘first’ is often repeated. The truth about narcosub design and building may be more prosaic. The variety of watercraft labeled under the banner of narcosubs summarizes some of the key features of the innovation and counter-innovation competition in the War on Drugs. The narcosubs demonstrate a variable combination of materials, designs, and building. Even narcosubs found in the same shipyard vary in several features. In this sense, each narcosub is a unique way to solve the problem of transporting large amounts of illicit drugs, producing a complex timeline that is problematic to define using traditional innovation concepts, such as incremental or radical innovation, but also to define as the result of pull/push factors. The process of innovation in the War on Drugs can be better described using the concept of dispersed peer innovation,6 in which the design and construction of these vessels, not being bound by standardized procedures, profits from the possibilities of creating their own designs with high degrees of flexibility. In this sense, it is possible to say that what smugglers produced with the narcosubs are different versions of a ‘techno-meme’ that gets combined with the local knowledge of maritime routes and boat building. Those involved in the process of outlaw innovation are able to mix locally available knowledge of traditional boat building with off-the-shelf technologies. One key issue when studying the evolution of narcosubs and other forms of drug traffickers innovations is how entwined they are with other forms of maritime drug transport. The process of incremental innovation does not necessarily produce a particular method that replaces older strategies. For example, a technical analysis of improvements of the go-fast boats or fishing boats demonstrates that there are few steps between semisubmersible methods and submersible ones. These few steps are provided by the availability of the knowledge to build such vessels within the relatively small areas where narcosubs can operate. Little is known about the day-to-day decisions on design and modification of such vessels. Official documents say little about the narcosub builders, but a set of documents allows us to take a glimpse at the organization of a narcosub enterprise. These include the Supreme Court of Justice ruling on the extradition of Colombian nationals to the United States in order to be judged by courts in the U.S. for criminal offenses, including narcotics violation, and reports from the law enforcement agencies and military. Several facts can be derived from the analysis of such documents. Narcosub builders are often independent of the owners of the cocaine. Several opportunistic relationships are undertaken, with drug traffickers either contacting the builders or the builders contacting the drug traffickers. As part of a plea bargain, a narco-submarine builder narrates how as a part of his organization he carried out and presented blueprints of ‘his’ narcosubs, and descriptions of the areas where the vessels could be built and launched. As part of his negotiation with prospective buyers, he shared his past experience of success in the building and operation of these boats. 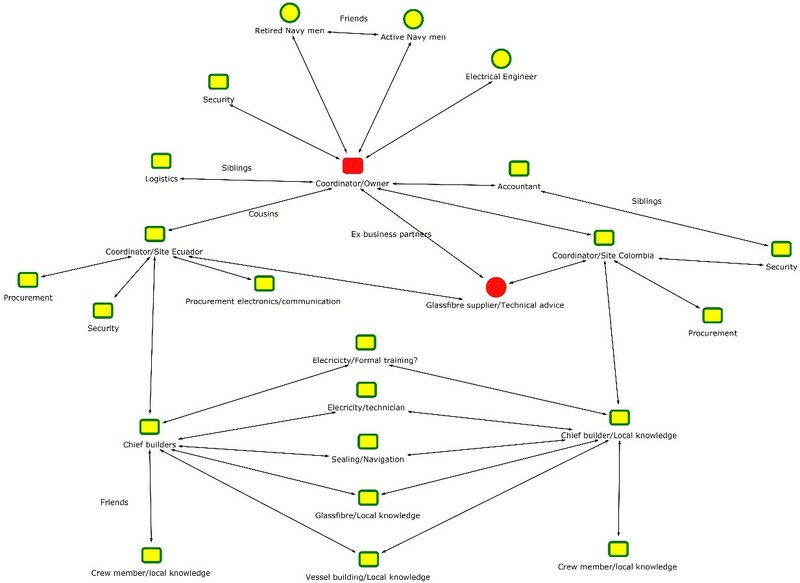 Figure 1 reconstructs the main links in a narcosub builder organization and shows the multiple forms of knowledge and relationships that can be found in such an organization. While some aspects of the design are carried out by specialists such as electrical and mechanical engineers, others are left to people with local knowledge, such as knowledge about fiberglass handling and coating. In this organization, another individual, the provider of the fiberglass, also plays the role of quality assurance guaranteeing that, in fact, the vessel is correctly waterproofed. Other individuals are in charge of the logistics, such as the purchase and transport of materials and personnel to shipyards. Finally, some individuals are hired as crewmen. They test the vessel and provided feedback to builders. The organization described in the legal files is interesting because it has two different construction sites; one in Colombia’s South Pacific and one on the Ecuadorian coast. The organization boss was not actually involved in the construction of the narcosubs, but he was the main source of finance. The main builder of the narcosubs is considered a “chief” within the organization. Besides providers of drugs, every shipyard has an administrator accompanied by a chief of security. The description provided does not delve into the process of designing and building narcosubs specifically, but shows the participation of people with formalized knowledge and others in possession of craftwork knowledge, such as the people involved in the woodworking and the fiberglass construction, some of whom worked in both shipyards. The fiberglass work was supervised by another specialist, who provided expert knowledge and supervision at both sites. This person was not part of the organization, but was the provider of the fiberglass. In the same organization, a mechanical engineer was identified, who was in charge of the design and building of the hatches, steering mechanisms, and galvanization of the narcosubs. The innovation in narcosub technologies is then carried out by a multitude of different groups with little incentive to collaborate among themselves. This gives rise to a wide variation of submersible and semisubmersible designs. Such technical decisions are taken by builders and drug traffickers in a context in which the actions of other groups and their enemy (law enforcement and military) are not always known.7 Narcosub builders are able to configure a complex design using a mix and match approach. Blending off-the-shelf solutions, local traditional knowledge, and technical-formal knowledge produces hybrids such as low-profile narcosubs using truck diesel engines. Drug smugglers do not just compete with the state, they also compete with other drug rings and other narcosub builders. This complex pattern of competition plays a role that promotes further local innovations. Through trial and error they master the building principles of the narcosub and introduce minor variations into their models. The variation and innovation in narcosub technologies, as well as the interpretation that actors, smugglers, and enforcement agencies make of such innovations, creates changes in a co-evolutionary fashion. In this way, the choices of the illicit actors, competing among themselves and against the state, continuously destabilizes and changes the landscape in which they act, triggering a situation in which multiple players attempt alterations, which create new adaptations. It has been argued that smugglers often have the capacity to change their strategies and designs after they been detected by law enforcement and the military. Nevertheless, a more complex understanding of the pattern of innovation in the War on Drugs, in which explanations are not given in terms of push/pull between state agencies and drug smugglers, but take into account multiple layers of competition and sources of knowledge, will provide better tools to control the illegal flows. One main consequence of this would be to escape the fallacy of flexibility, in which the explanations of the process innovation in the War on Drugs is given solely based on drug traffickers’ actions. Escobar, R., & Fisher, D. (2009). The Accountant’s Story Inside the Violent World of Medellin Cartel. New York: Hachette Book Group. Jacome Jaramillo, Michelle. “The Revolutionary Armed Forces of Colombia (FARC) and the Development of Narco-Submarines.” Journal of Strategic Security 9, no. 1 (2016): : 49-69.